← Thing to do in Berlin? The city of London has been an iconic city for centuries, as well as one of the top tourism destinations on Earth. In 2012, the capital city of the United Kingdom will also serve as the host city for the Summer Olympics. Although the city is typically busy and full of action, there is no denying that the atmosphere will be even more exciting during the summer months of 2012. The official dates of the Olympic Games are between 27 July 2012 and 12 August 2012, but it can be expected that the city will be busier than normal in the days and weeks prior to the event as well as after. Let this article serve as your guide to tourism during the 2012 London Olympics, including everything from accommodation to dining and local area attractions. 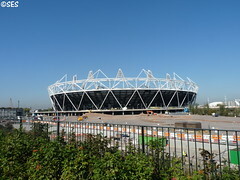 The photo above shows a view of the Olympic Stadium in Stratford, East London. Accommodation in London: As might be expected during an event of this size, accommodation will be an issue for visitors in London during the Summer Olympics in 2012. Many of the largest hotels in the city centre are already fully booked, both because of international travellers and the athletes themselves who need accommodation for the event. Thankfully, there are many specifically designated London Olympics rentals available for travellers. Choose from London apartment’s right in the heart of the Olympic Zone or housing rentals further away from the centre. Whatever you decide, try to book accommodations as soon as possible to prevent disappointment, as it is predicted that nearly every available bed in London will be full for the events. Attractions in London: For many, the main attraction in London will be the Olympic events themselves. However, there is much to see and do in the city aside from the games. On days where you are without tickets or just want a break from the action, be sure to visit some of the famed landmarks in London like the Tower Bridge, Big Ben, Buckingham Palace and Westminster Abbey. 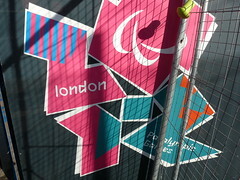 The photo above shows the London Olympics 2012 logo. Tickets for the Olympics: There was some controversy surrounding the sale of tickets for the 2012 London Olympics. As might be expected, there was a far greater demand for tickets than was available. By the beginning of 2012, all the available tickets have been bought and the only ways to secure additional tickets are by purchasing them through individuals rather than the official vendor for the Olympics. Transportation during the Olympics: One of the major concerns for the logistics of the London Olympics in 2012 is the issue of transport. The best choice for travellers is to purchase an Oyster card in advance in order to travel quickly and affordably on public transport. Most venues will have two or more means of transport for spectators to use in order to alleviate congestion. Venues outside of the city, such as Portsmouth which will be used for sailing events, will need to be reached by private car in most cases. By reading this guide, visitors will be prepared for their trips to London during the 2012 Summer Olympics. Although much of the planning needs to be done in advance with regard to accommodation and ticketing, there will be many attractions to explore around the city at a moment’s notice. Transport seems to be a key concern but I think it might be quite fun to ride the Boris bikes to some events, and I really don’t think there will be any real Olympic Travel Disruption anyway. Sorry for the late reply, I was very busy. Just had a look at the link you sent and I guess this will be helpful for a lot of people attending the Olympics. Thanks for your comment & a very interesting read on top 5 escape routes from the Olympics. Pingback: MyBlogGuest March Round-Up and News!